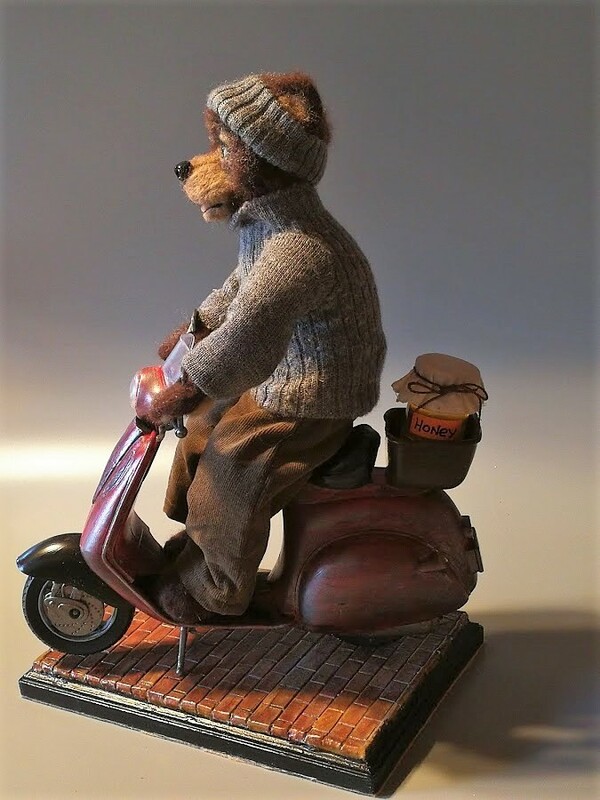 “Honey Delivery ” is One-Of-A-Kind composition. 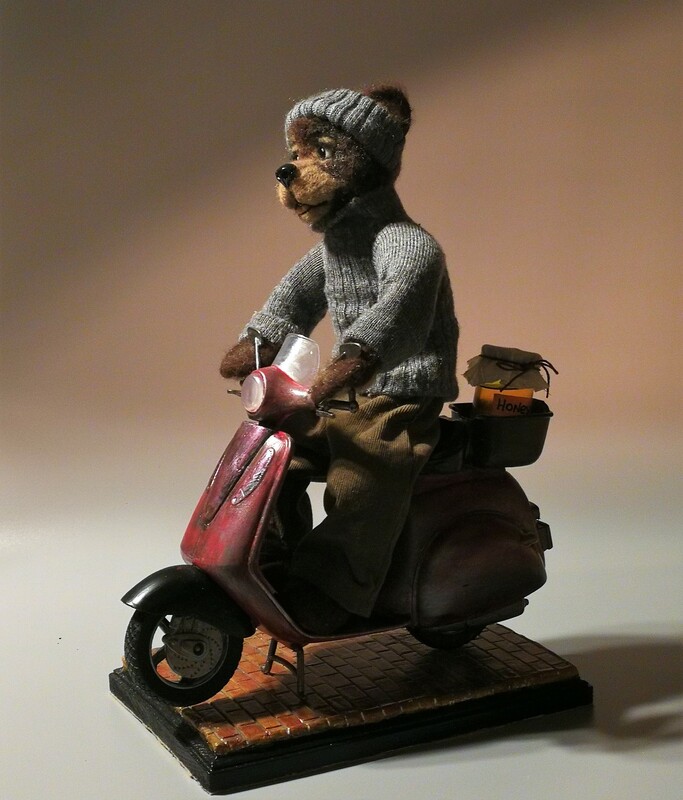 Cute little Bear is riding his motorcycle with a jar of honey in the basket. 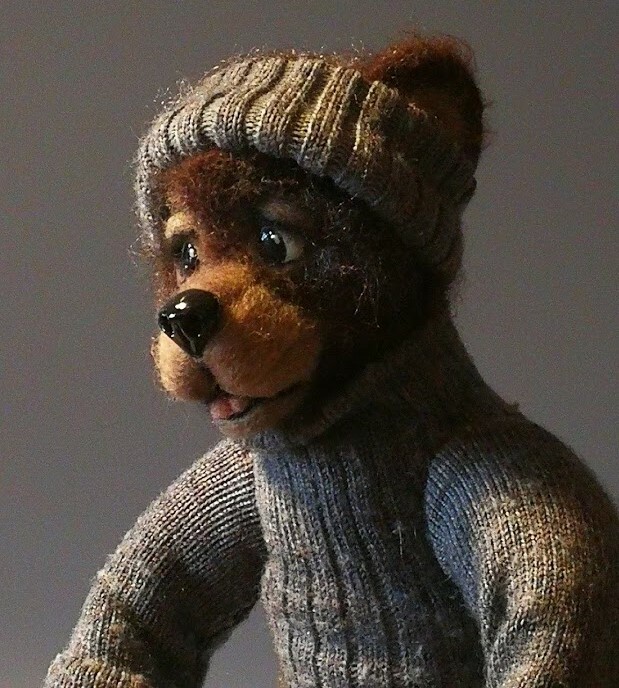 The Bear’s head and paws were created with felting needle technique. 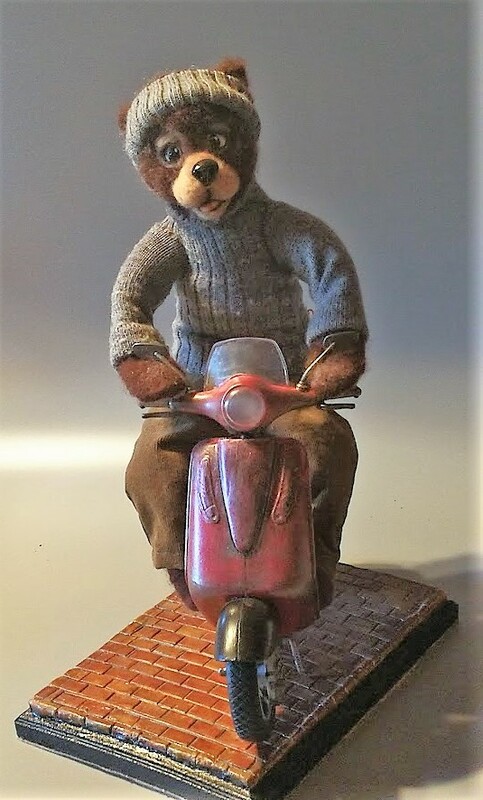 He has soft body over armature. 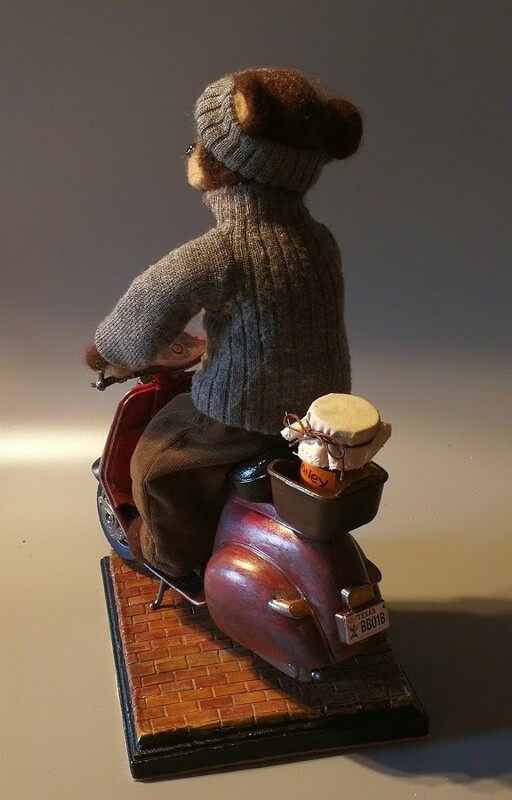 The motorcycle is plastic, weathered with acrylic paint and sealed with a professional paint sealer. 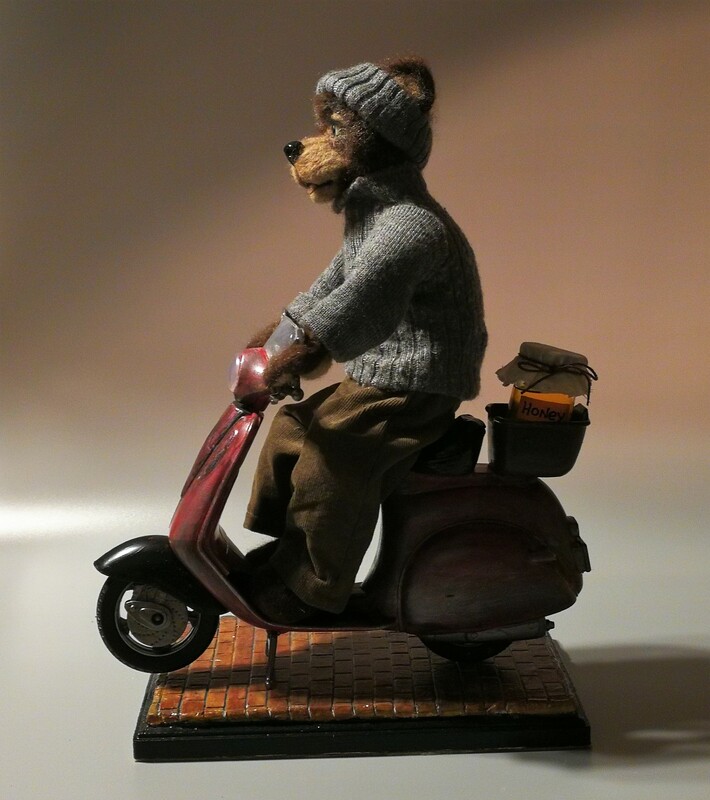 The Bear and his motorcycle is free standing on a base made with clay bricks over the wood and painted with acrylic. 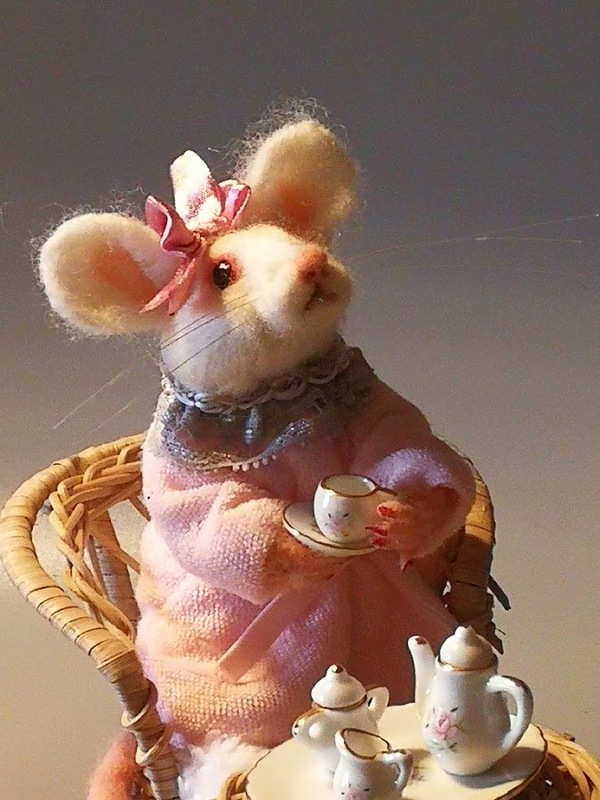 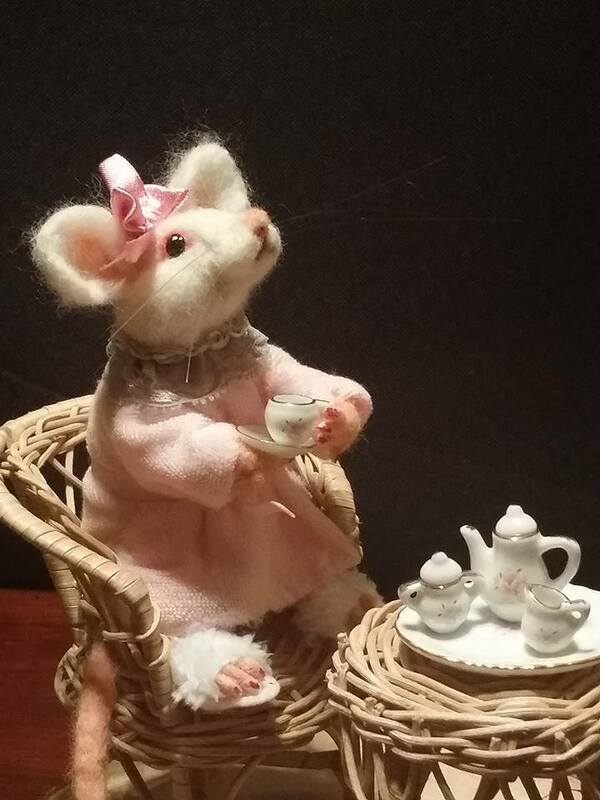 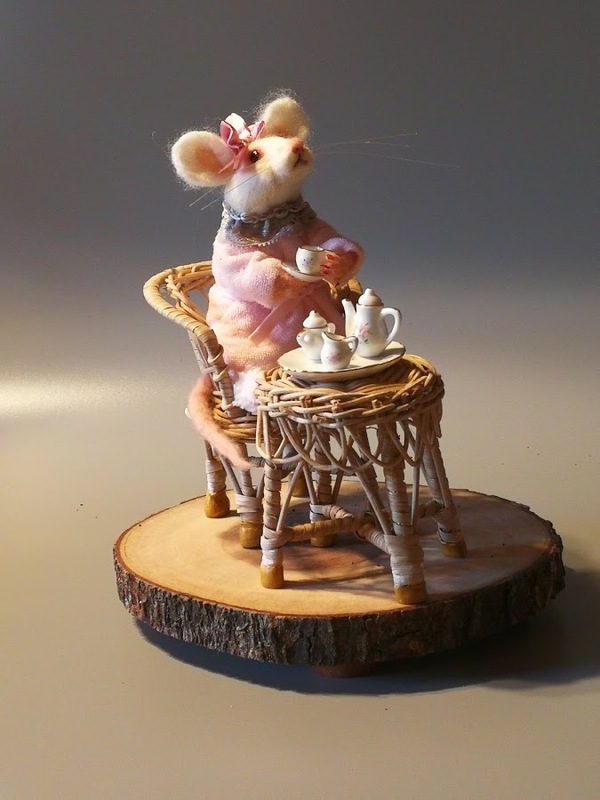 ” Morning Tea” is One-of-a-kind art doll composition made with felting needle technique. 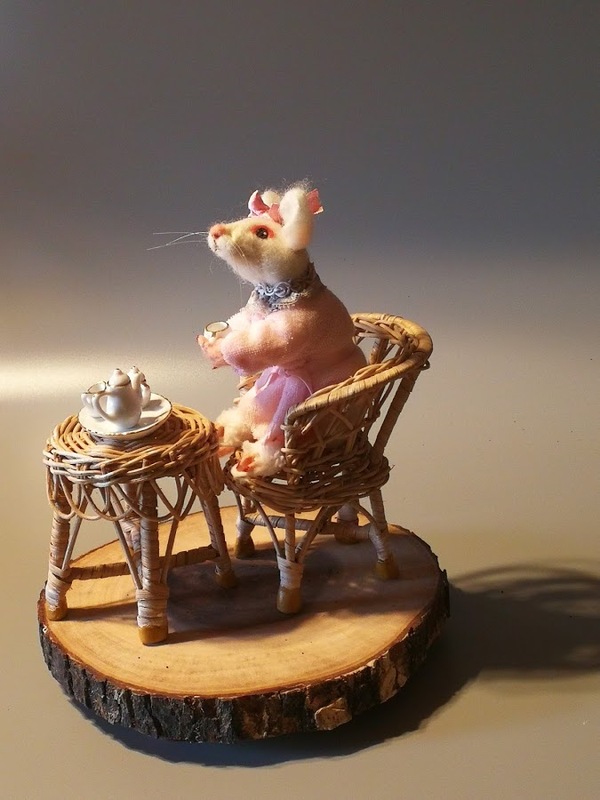 This charming white mouse was created from white merino wool. 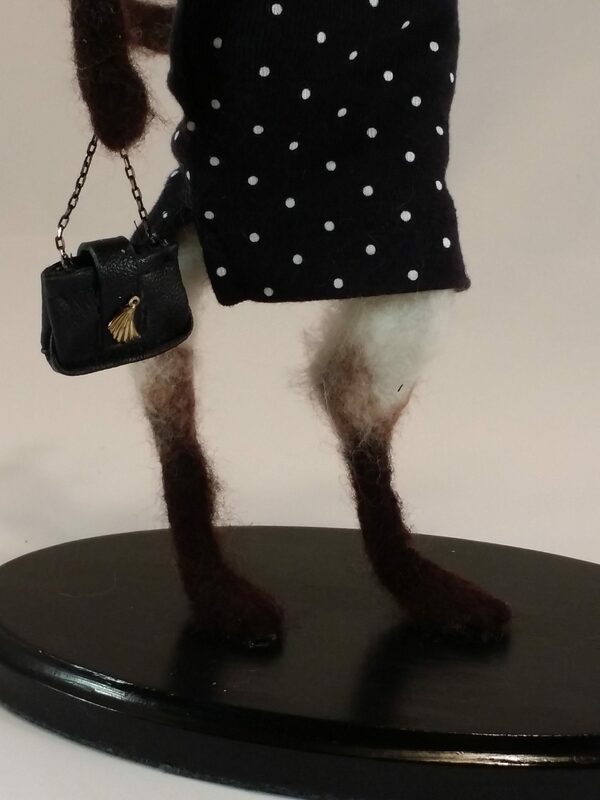 Her body was sculpted over an armature. 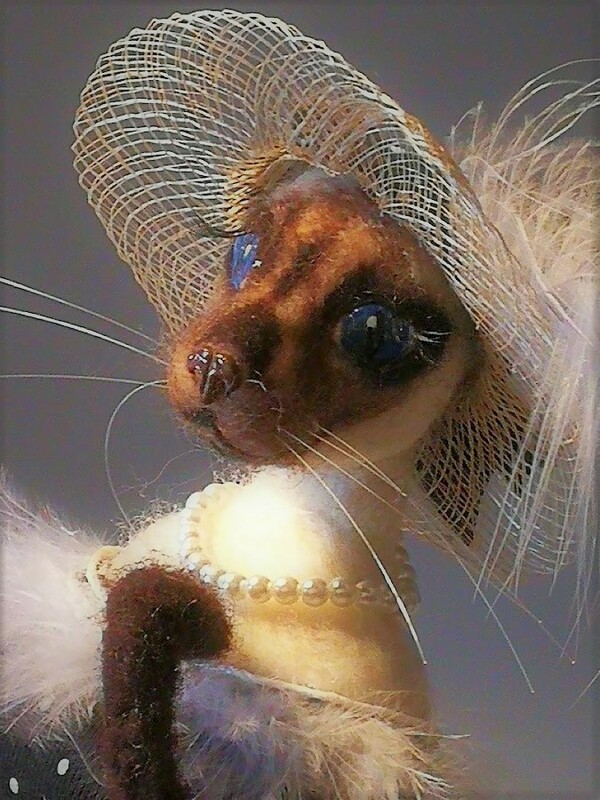 Doll’s eyes are made from clay. 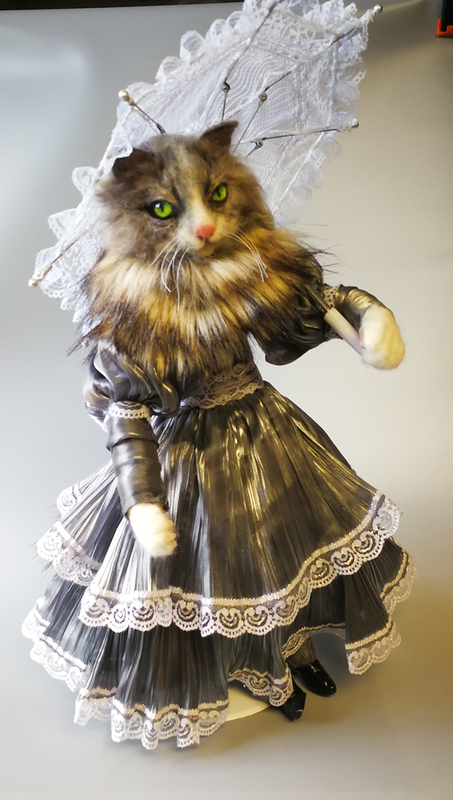 The doll is 5″. 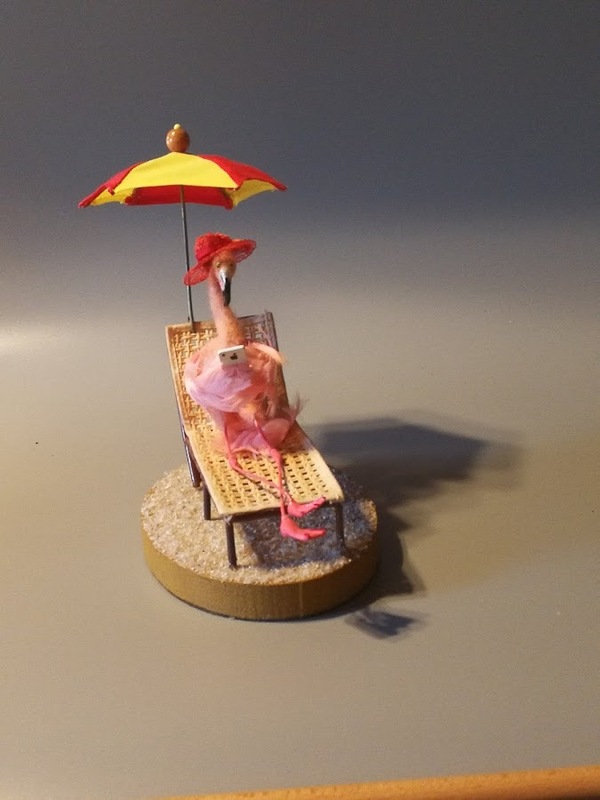 The whole piece dimensions are 9″ x 9″. 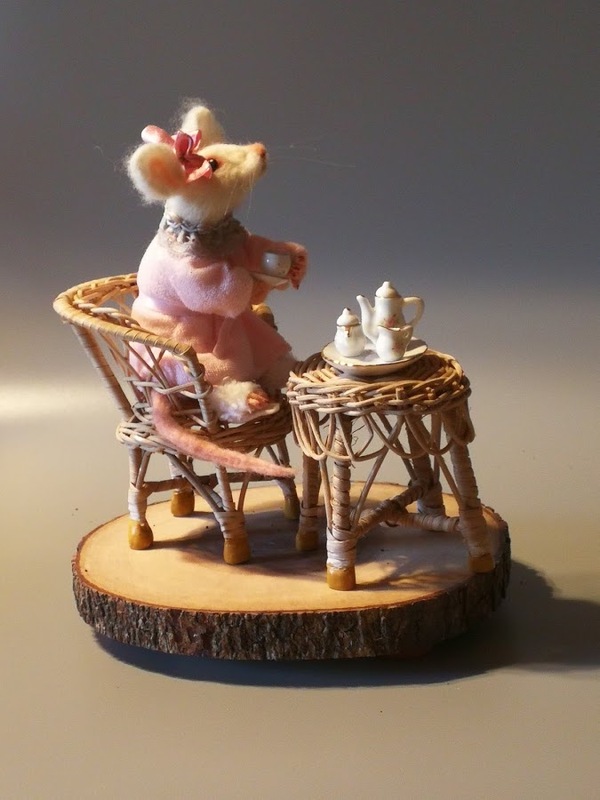 The composition includes miniature wicker chair and table. 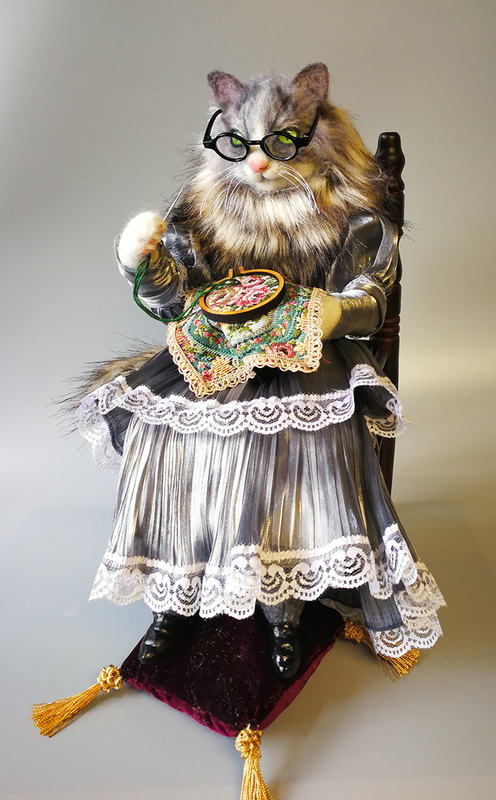 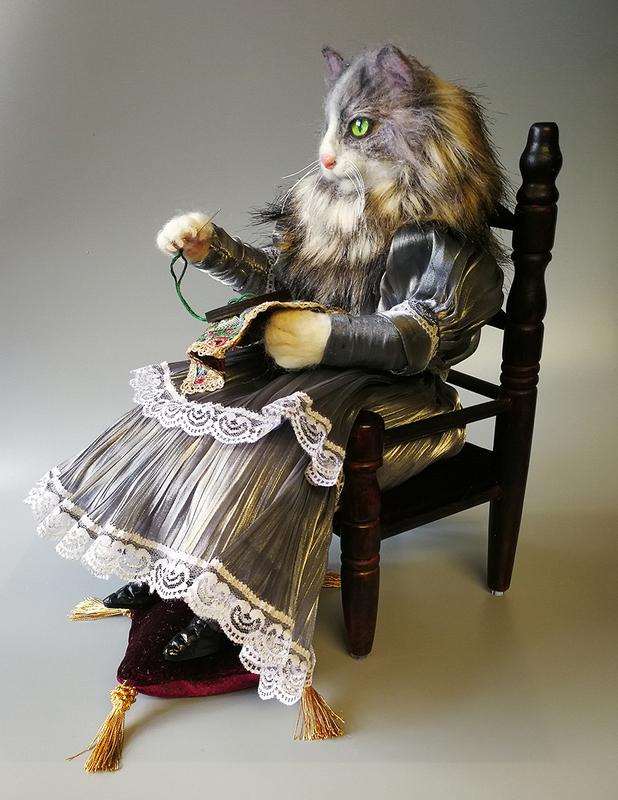 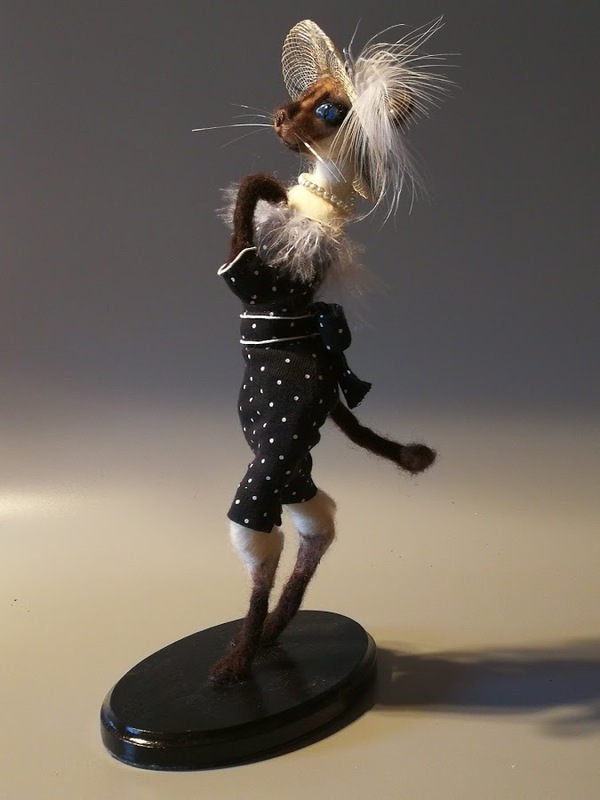 “Catherine, the Cat” is One-Of-A-Kind doll made with felting needle technique. 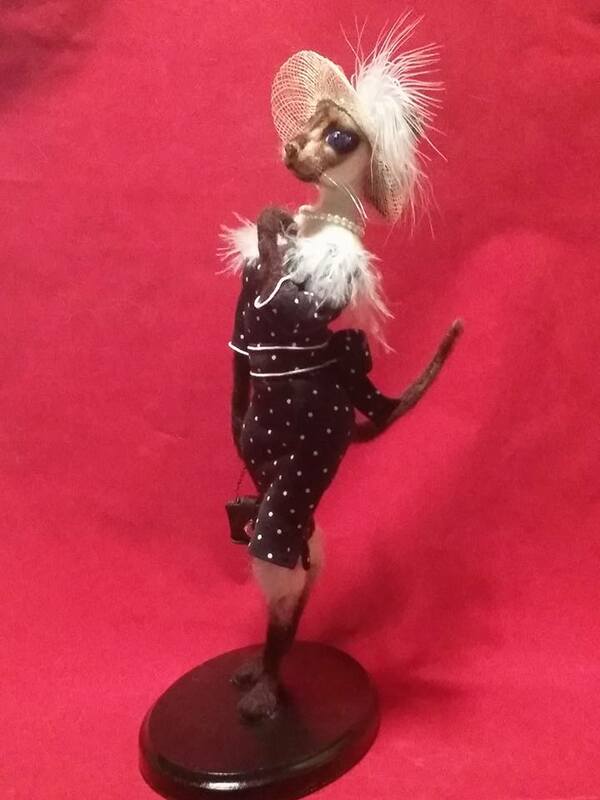 Catherine is a very fashionable Siamese cat. 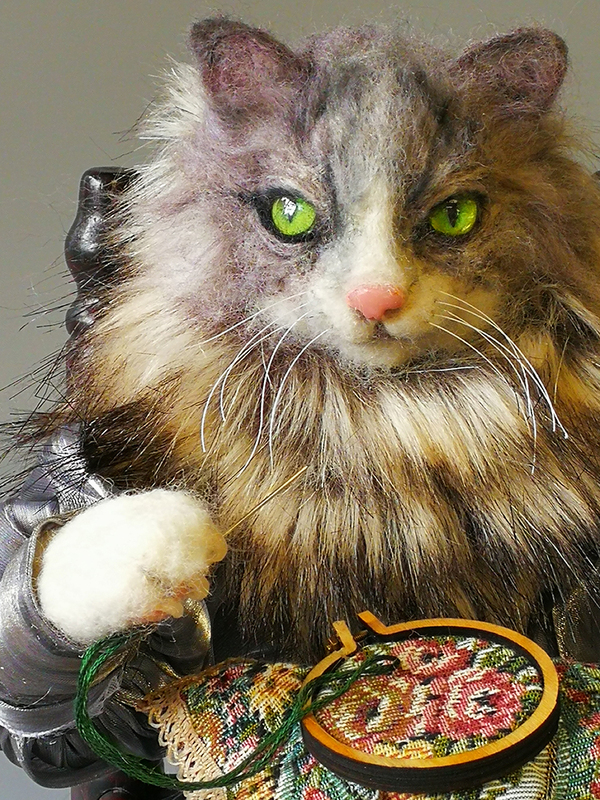 She has big blue eyes made with clay and painted with acrylic. 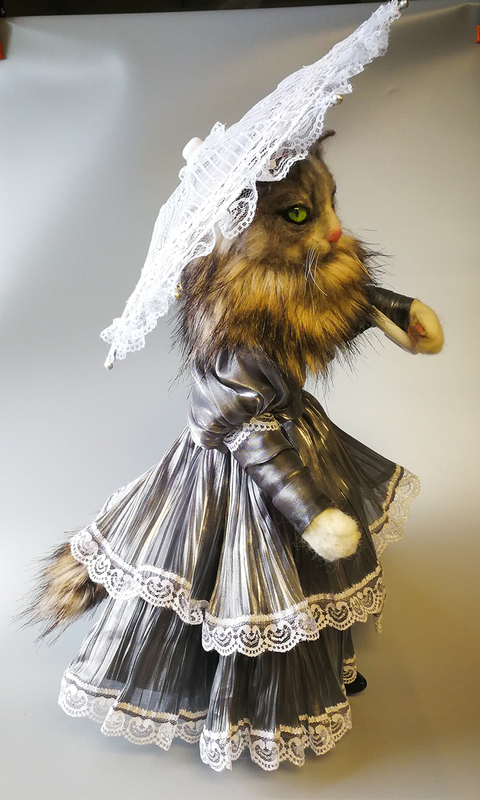 Her dress tightly fits her shaped body. 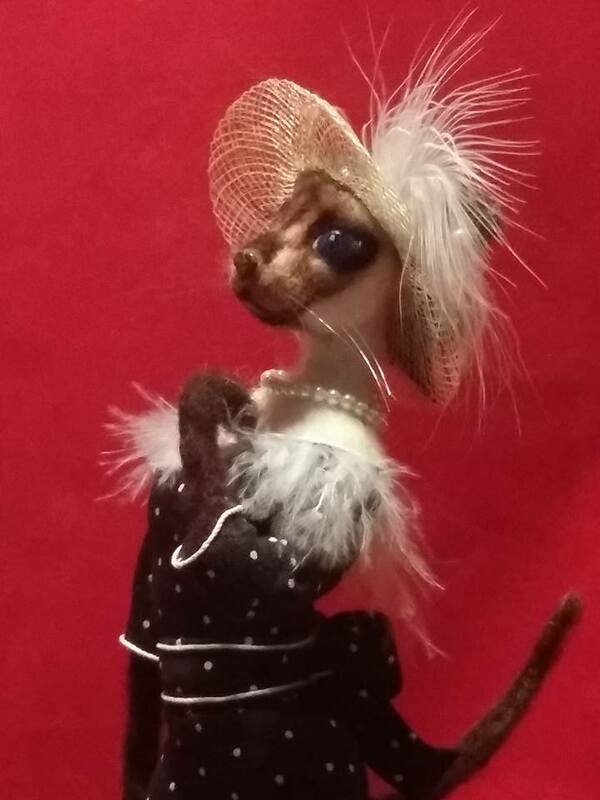 Catherine is wearing pearl necklace and earrings, cute summer hat and very feminine leather purse. 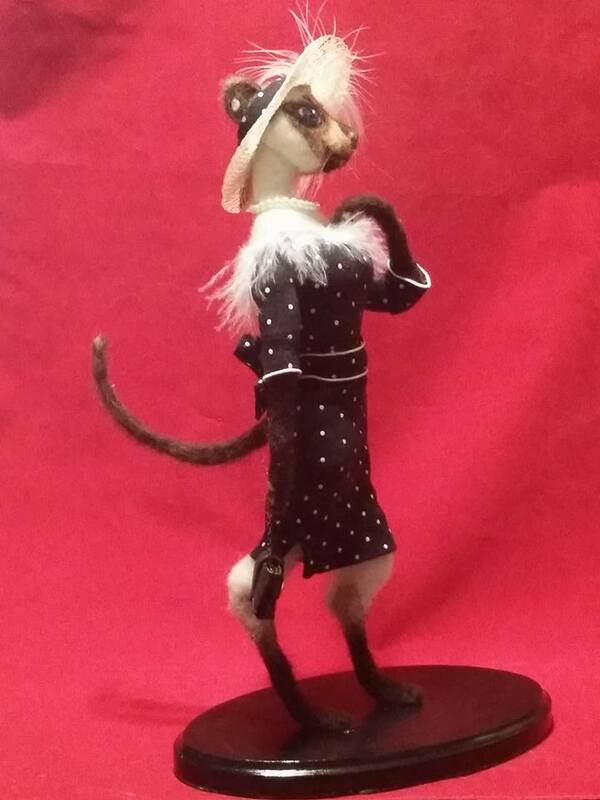 Catherine is 14” tall, including the base. 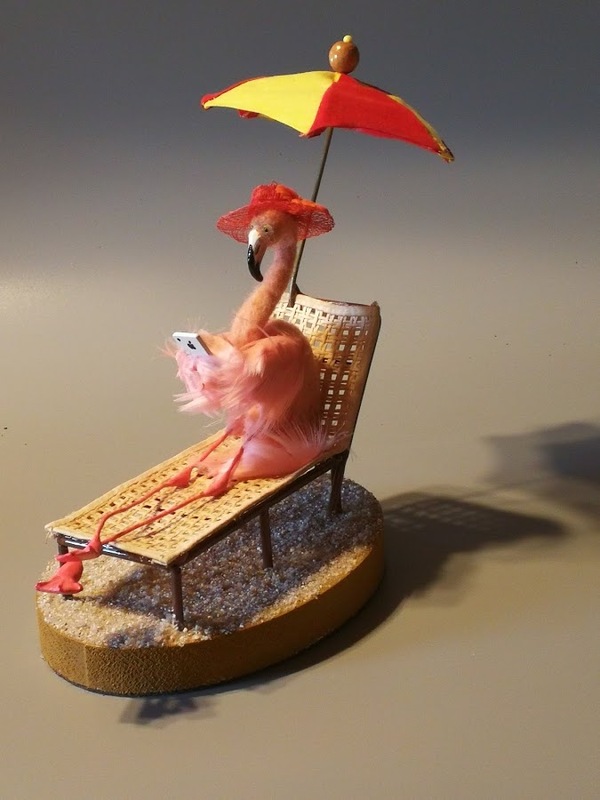 If you have an Apple fan friend or relative, they will love this funny pink flamingo with a little iPhone in his wings. 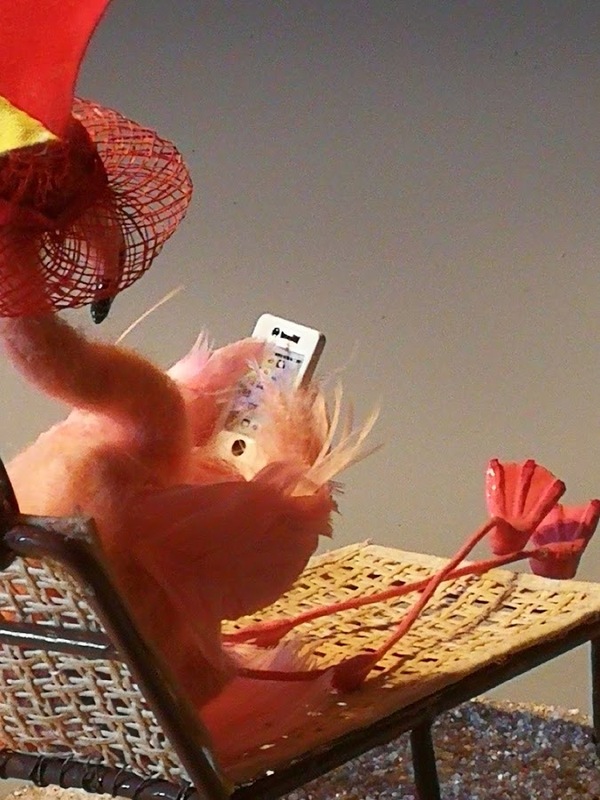 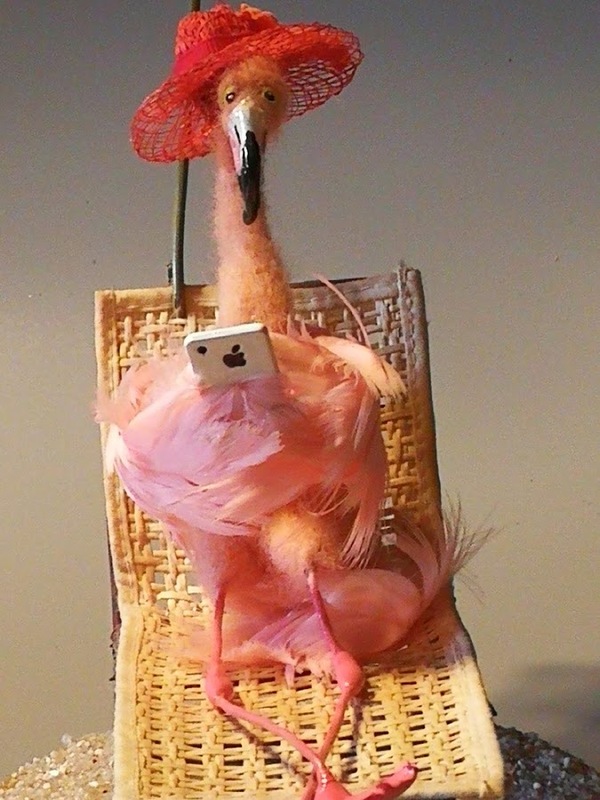 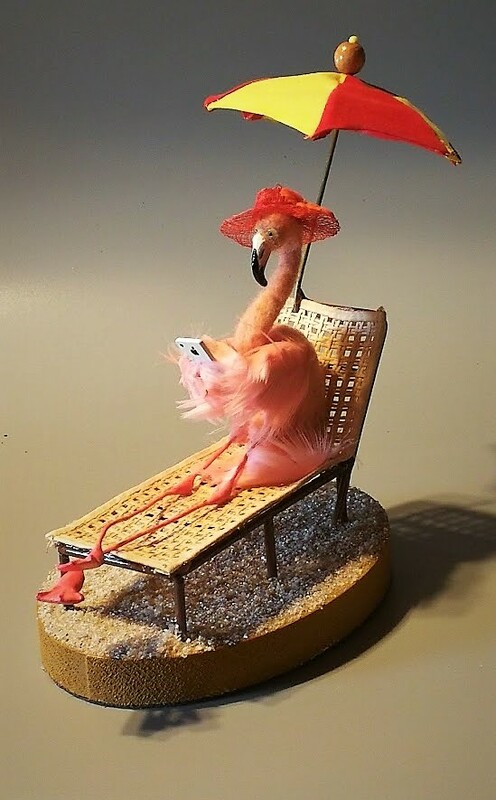 The Flamingo is texting someone sharing her vacation’s photos. 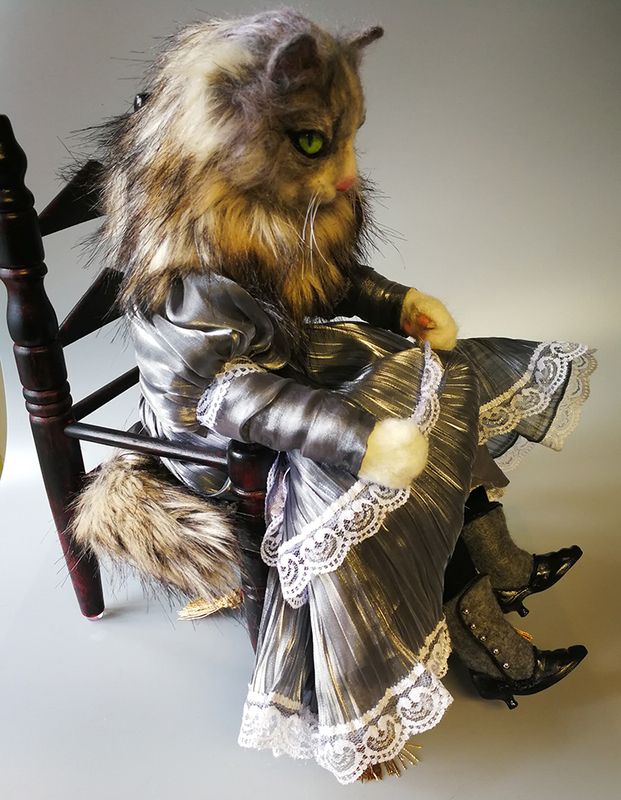 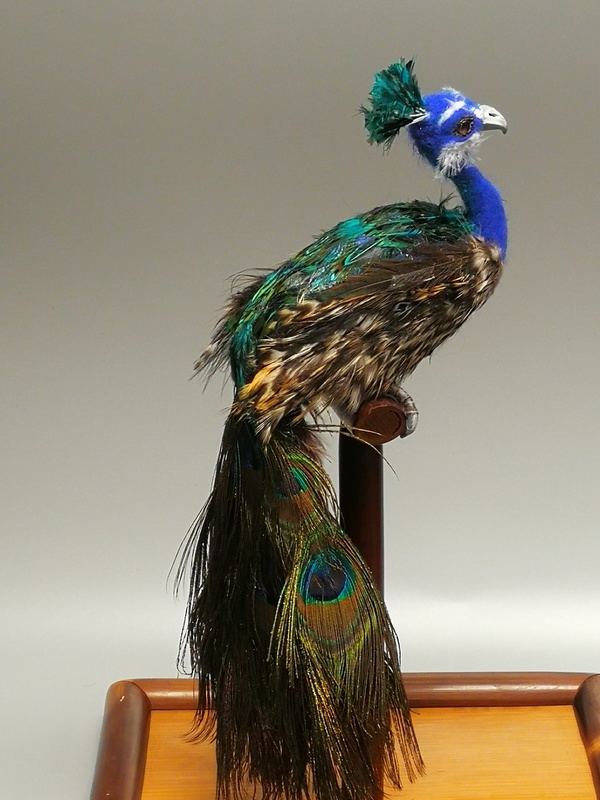 The doll is made with merino wool and real feathers. 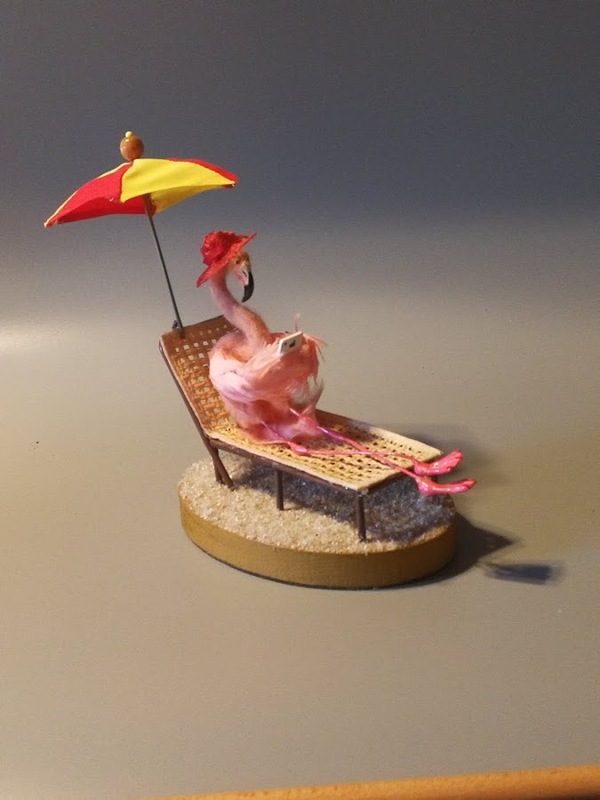 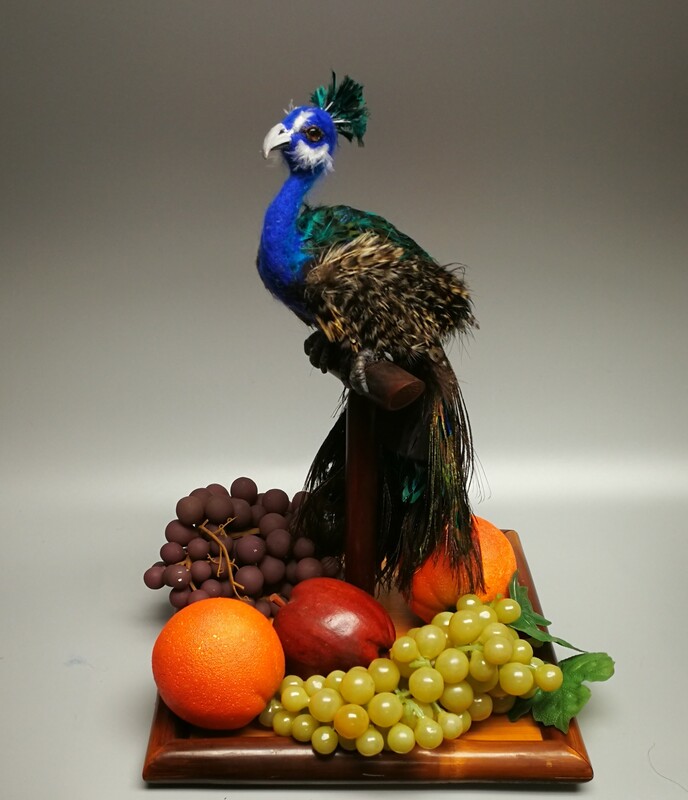 Her legs, eyes and beak are sculpted with clay and painted with acrylic. 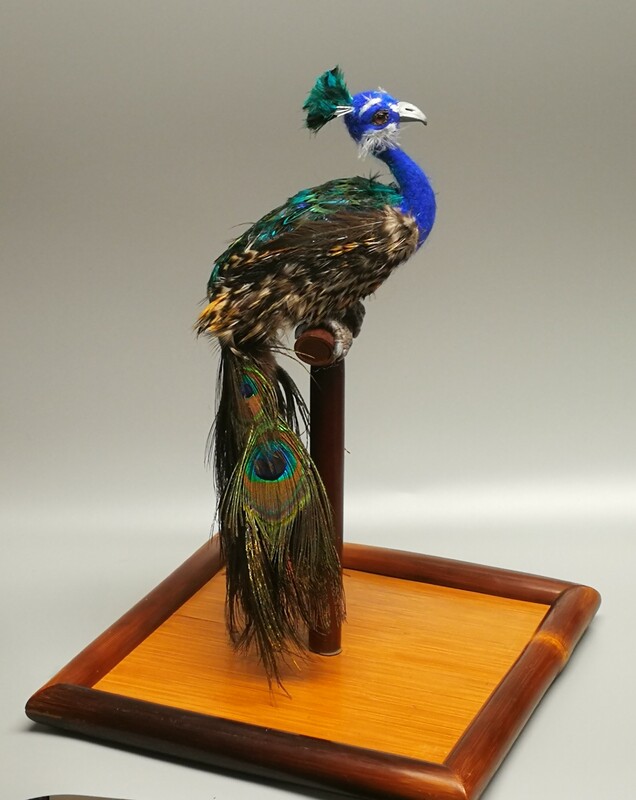 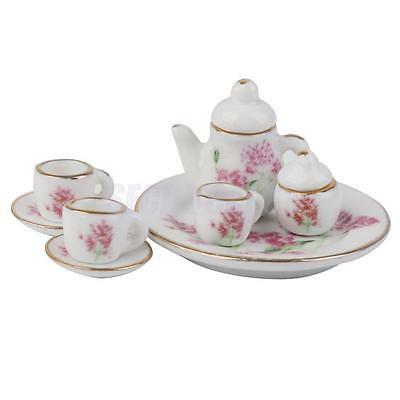 Dimensions: 10″ x 10″ – tray base, 14″ – the height of the bird including tail.